Friends! Romans! Countrymen! Lend me your forks! For I, Fat William Shakespeare have arrived in New York. Yea, it is I, the corpulent bard. It has been too long since I blogged last. I've been toiling away at a new production of Romeo and Juliet where our heroes engageth in a frankfurter eating contest at the Isle of Coney and die very tragically indeed. As you may recall, I was brought back to life, in 2005, by a merry band of scientists who love the theatre. But, alas! High fructose corn syrup and trans fats in modern delicacies have made me morbidly obese. So, as I champion the benefactors at the channel of Bravo to bequest me my own reality programme wherein I lose weight in a very entertaining manner, I will continue to guest blog on the township of Bethville web site. Today, I address fashion, as New York is a great metropolis of privilege and interesting fashion choices. So, let us to the gallery! Make haste! Here, we see a very elegant lady and...what ho! 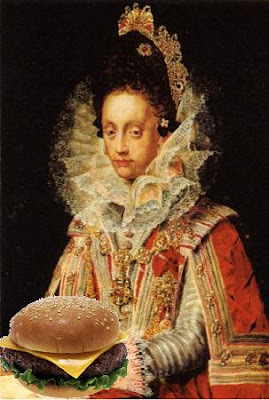 Is that perchance a delectable cheeseburger with a seeds of sesame bun? T'would be a pity for so fine a lady to eat so vile a thing. Fare thee well, cheeseburger! Into my stomach! Anon! Alackaday! Sir Walter of the house of Raleigh! (Nature that washed her hands in milk? Fie! A curse upon ye and thine miserable attempts at turning a phrase!) 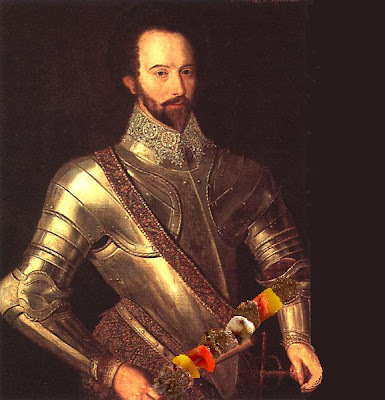 He is wielding a kabob most juicy and wearing some items of armour. He cannot move his arms! So, I eat his kabob! Queen Elizabeth Regina Gloriana! Mine lady! I kneel before thee most humbled. Before I eateth thine cookie most delicious. Well, now my gut is full to bursting. Pray pardon me, dearest readers. I must now adjourn to mine privy. Fare thee well until the time is next! Is doust yon hither a kabob or is doust happy to see yee, that is the question. @Lord Coaltrain: Villain! Hold thy tongue in the name of England!